"Can this world do no better than you as its champion?" "Probably. I just do the best I can"
And so we reach the final season of Doctor Who which begins with the return of an old friend. 'Battlefield', written by Ben Aaronovitch who had also written the opening story of the previous season, reunites the Doctor with his old friend Brigadier Lethbridge Stewart, retired head of UNIT. UNIT itself is also back in action for the first time since the mid-seventies. This new look UNIT, which is now capable of taking down anything from Cybermen to werewolves, also has a new leader, Brigadier Winifred Bambera. 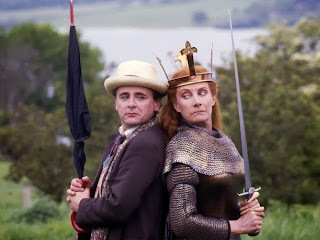 Lethbridge Stewart is called out of retirement to assist UNIT and the Doctor against figures from Arthurian legend who have travelled 'sideways in time' from another dimension where those legends are true. Chief villain is Morgaine, half-sister of King Arthur and wielder of great magical powers. She and her son, Mordred have travelled to 'our' Earth to find Excalibur which is buried at the bottom of a lake in an ancient spacecraft. Whilst 'Battlefield' was criticised at the time for, amongst other things, some very dodgy acting one cannot fault its ambition. Despite its small budget it's a fast-paced adventure with a lot of action and explosions, exactly the sort of thing you'd expect from a UNIT story. In terms of characters, there's a real effort being made in both the previous season and this one to make the Doctor mysterious again. Here we discover that, in his future, the Doctor may just possibly become the Merlin of Arthurian legend. It's all left open to speculation but this unseen future Doctor leave his Seventh incarnation a note that basically explains the plot. Of course this possible future for the Doctor has never been referred to again on TV so time will tell whether he really will become Merlin at some point. And then there's the Brigadier. Originally this was to be Lethbridge Stewart's swansong and he was to have been killed off. However, wisely as it turned out, Producer John Nathan Turner changed his mind. 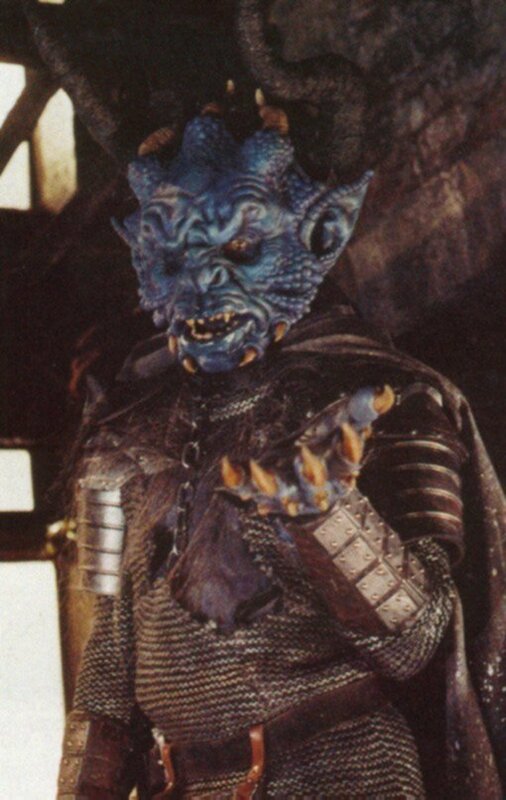 Nevertheless it is the Brigadier that saves the day as he faces off alone against the demonic blue-skinned Destroyer that Morgaine has let loose on Earth. 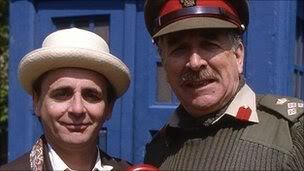 This would be the Brigadier's final appearance, in the TV series at least, and this story feels like a fitting finale. After the action-packed season opener that was 'Battlefield' things settle down a bit with the next story, 'Ghost Light'. Although shown second in the season this was actually the last Doctor Who story to be made in the programme's original 26 year run. This story is also the first in what is a trilogy of stories focusing on the character of Ace. Here, the Doctor takes Ace back to her home of Perivale, albeit a hundred years early. The setting a large Victorian house called Gabriel Chase inhabited by a bizarre assortment of character headed up by one Josiah Samuel Smith who is not all he appears to be. The story was quite heavily criticised at the time for being too complex to follow which is fair assessment at least until the final episode which literally throws some Light on events. Light is an angelic looking being who has been hibernating in a crashed stone spaceship beneath the house. He had been travelling through space cataloguing species on different planets and crash landed on Earth millions of years earlier. Josiah Smith is one of Light's catalogue of creatures who has got loose and evolved himself into a Victorian gentleman who wants to take over the British Empire. Light, on the other hand, now wants to destroy the Earth and the Doctor has to stop both of them. There, it's as simple as that. I think. Next is 'The Curse of Fenric' which sees the Doctor and Ace travel to an army base in 1942 and face the Haemavores, vampire creatures from the far future that have been brought back in time by a being called Fenric. Fenric is a force of 'pure evil', according to the Doctor, that was once imprisoned by the Doctor in an ancient flask. Fenric has now escaped his prison and wants, amongst other things, revenge on the Doctor. This is a big story for the character of Ace, not least because unknowingly she meets both her grandmother and the baby who would later become the mother that she hates. 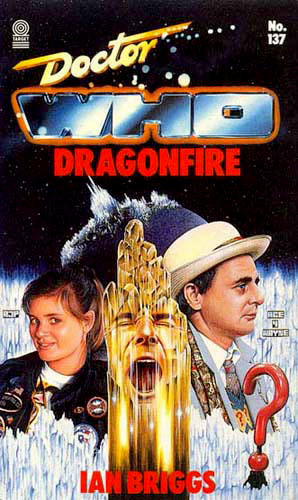 It's also revealed that it was Fenric who caused Ace to shot across time and space to meet the Doctor in her debut story, 'Dragonfire', which would in turn lead to the Doctor arriving at this point in time to meet Fenric. It's doubtful that this little story arc was in anybodys head when Ace first appeared two years earlier but the production team have certainly done a good job in weaving various elements of the last two season together to give the impression that it was all pre-planned. Ace also has another doomed romance with a soldier. This time it's with Russian Captain Sorin who has come to the army base to steal a top secret encryption machine. He ends up siding with the Doctor and Ace but, unfortunately, it turns that he's as much a pawn of Fenric as most of the other characters in the story. Towards the end of the story Fenric takes over the body of Captain Sorin in order to have his final confrontation with the Doctor. 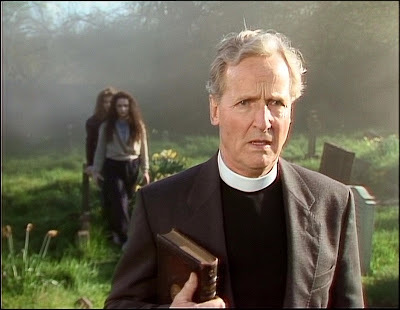 The Doctor and Ace are also ably assisted by Nicholas Parsons as the Reverand Wainwright, a priest who has lost his faith thanks to the War. As well as being a very likable character, Wainwright is also there to emphasise the power of faith as a weapon against the Haemavores. Things come to a head when Ace uses her faith in the Doctor to hold back the Haemavore leader whilst the Doctor is in facing off against Fenric. This is unfortunate as the Doctor had earlier persuaded the Haemavore to turn on Fenric which Ace was unknowingly preventing it from doing. The only solution is for the Doctor to destroy Ace's faith in him by unleashing some truly vicious and hurtful insults about her. Damage done, the Haemavore is able to turn on Fenric and finish him off once and for all. And so we come to 'Survival', not just the final story of the season but, for some years, the final ever Doctor Who story on TV. Of course, at the time it was made no one knew that this was going to be the final story which is actually a good time. There's no sense that this is a series that is winding down or coming to an end. Instead it's just the Doctor and Ace doing what they do best, getting into adventures and fighting monsters. The Doctor takes Ace back to Perivale for the second time this season, except this time its Perivale in the 1980s rather than the 1880s. Ace is finally home but she finds that all her friends have gone with no explanation. Investigating, the duo find that residents of Perivale have been abducted and taken to the remote planet of the Cheetah People. And the person behind these kidnappings? None other than the Master. As seems to be typical for the Master, he's got himself into trouble and is using others to get him out of it. He's somehow become trapped on the Cheetah's world and cannot escape it. He's also becoming a Cheetah person himself which is a curse of the planet. The only way for anyone to escape the planet is to wait for someone else to become a Cheetah and then use their powers of teleportation (which all the Cheetah's have) to escape. Ace begins to transform and is therefore able to use her new abilities to rescue herself, the Doctor and her friends from Perivale. But the Master escapes too and this leads to a confrontation between him and the Doctor, first on the streets of Perivale and then back on the planet of the Cheetah People. 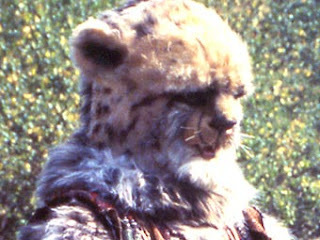 The last we see of the Master is him helpless on the planet of the Cheetah People as it's about to explode. As we will see in the future, clearly escapes this fate but it's never explained how. As for the Doctor and Ace: they go walking off into the sunset together, looking for new adventures. 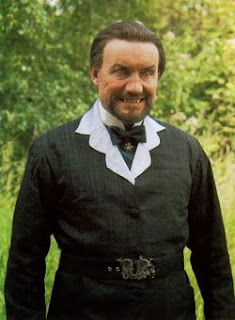 Shortly before the final episode was broadcast (just 2 weeks in fact), John Nathan Turner decided to change the end of the episode as it seemed likely that this was to be the final ever episode of Doctor Who. To that end a new speech was written for the Doctor at the climax of the episode. Sylvester McCoy recorded it and it was dubbed over the visuals that had been shot some months earlier. The end result was one of the most famous speeches in the history of the series. Although slightly melancholy it also has a positive note to it. The series might be over but the Doctor and Ace still have work to do. 1989 saw three stories released on video by the BBC. Fourth Doctor story The Ark in Space, Third Doctor tale The Time Warrior and the First Doctor's first encounter with the Daleks were all released this year. 'The Daleks' wasn't just the first William Hartnell story to be released on video, it was also the first to be released completely uncut. Previous releases had been edited into 'mini-movies, for want of a better term, with the beginning and end title sequences removed. This story was the first to leave all the episodes intact with nothing edited out. Due to its length this story was also the first to be released on two tapes. Reeltime also released a number of new interview tapes in the Myth Makers series. The impressive selection this year included Jon Pertwee, Tom Baker, Colin Baker, Richard Franklin (aka Captain Mike Yates) and a special release all about the Doctor Who Magazine. For only the second time in its life Doctor Who found itself treading the boards. 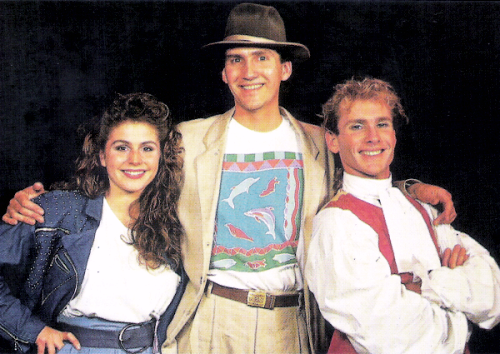 Touring the country throughout the summer of 1989, Doctor Who: The Ultimate Adventure, written by the ever-reliable Terrance Dicks, was a lavish stage show which starred Jon Pertwee as the Doctor initially before Colin Baker took over the role for the latter stages of the tour.Also, for one performance only, David Banks - who played a mercenary in the play and had been the Cyberleader on TV - took over as the Doctor when Jon Pertwee was ill. The show included Daleks, Cybermen, an impressive light show and even a couple of musical numbers so it's perhaps not surprising that it did well at the box office. There were apparently plans to take it abroad at one point but, in the end that didn't happen. One of my favourite audio releases came out in 1989. Variations on a Theme was an EP record which, as its title implied, included four different versions of the Doctor Who theme. The four themes were composed by the three men who had composed the music for the last three years of the series - Keff McCulloch, Dominic Glynn and Mark Ayres. All four themes are very different and really try to do something different with the familiar tune. My personal favourite is Keff McCulloch's jaunty Latin Mix although the whole album is worth hunting down if you can find it. Meanwhile, former Cyberleader turned author David Banks appeared in not one but three audio releases. 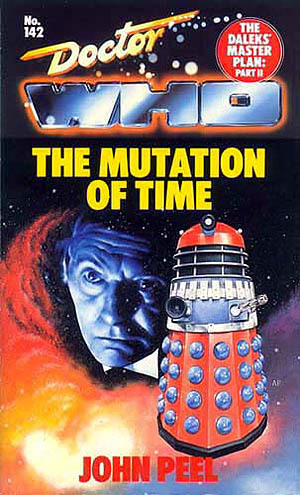 The ArcHive Tapes were based on his 'Cybermen' book that had been published the previous year. Banks adapted and narrated this series of four tapes, the first two of which were released in 1989. Banks was also one half of 'The Ultimate Interview', a 60 minute tape which saw Banks and Colin Baker interviewing each other whilst they were both on tour performing 'The Ultimate Adventure'. By 1989 the majority of the TV stories had been novelised and, with the TV series coming to an end, the editors at Target books were looking for ways to extend the range. 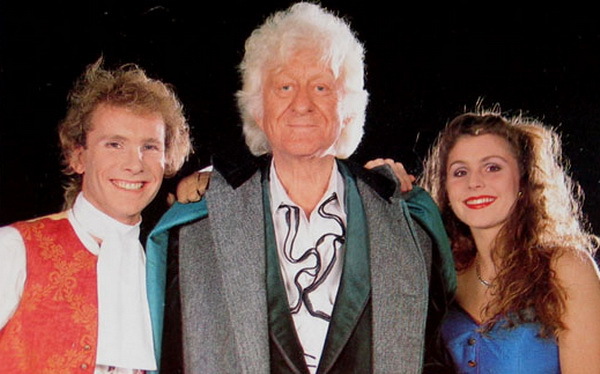 One idea was to novelise scripts of stories that never made it to screen, in particular those stories that had originally been intended for Colin Baker's second season in 1986 before Michael Grade intervened and they dropped in favour of 'Trial of a Time Lord'. The first two of these were published in 1989. 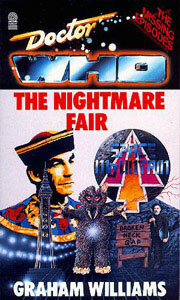 'The Nightmare Fair' was written by Graham Williams, who you may recall was the Producer of Doctor Who in the late Seventies. The story, had it been made, would have been set in Blackpool Pleasure Beach and featured the return of the Celestial Toymaker, not seen since 1966. 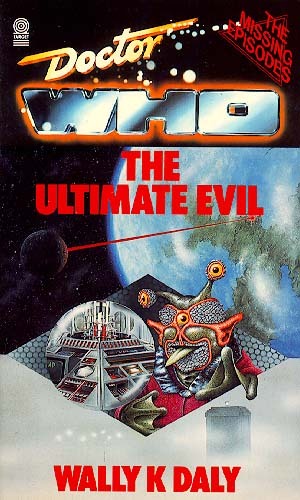 The second book, 'The Ultimate Evil', was written by well-known science fiction author Wally K Daly and saw the Doctor going up against an alien arms dealer. In terms of the other novelisations released in 1989, the majority were either First or Seventh Doctor books. For the First Doctor we were given 'The War Machines', 'The Chase' and 'The Daleks Masterplan'. 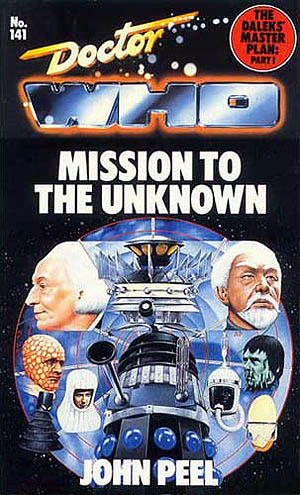 On TV 'Masterplan' was twelve episodes long (thirteen including the prologue episode, 'Mission to the Unknown'). As a result the novelisation was split over two books. Seventh Doctor fans were treated to novelisations of 'Delta and the Bannermen', 'Dragonfire', 'Silver Nemesis' and 'The Greatest Show in the Galaxy.' Finally there was a pair of Sixth Doctor novelisations published, 'Attack of the Cybermen' and 'Mindwarp' - part of 'The Trial of a Time Lord'. Beyond the novelisations there was little else new in the way of books. 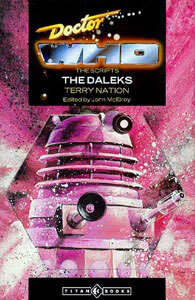 The series of script books that had begun in 1988 continued with 'The Daleks', 'Tomb of the Cybermen' and 'The Talons of Weng Chiang' all being released as scripts. We also the had the much anticipated second volume of the Doctor Who Encyclopedia, covering the letters E to K. Finally, Jean-Marc Lofficier's Doctor Who Programme Guide, previously published in 1981, was updated and republished, now covering everything up to the end of 1989. In the Doctor Who Magazine comic strip, much of the year was taken up with the Doctor trying and failing to get to the planet Maruthea in order to attend the birthday party of his never before mentioned friend Bonjaxx. The Doctor's first stop on his way to Maruthea is a planet that is experiencing flooding of Biblical proportions in the 2-part story 'Time and Tide'. The Doctor aids the sole surviving member of the planet's race and their unborn child to build a raft and ride out the flood. Following this comes 'Follow That TARDIS!' 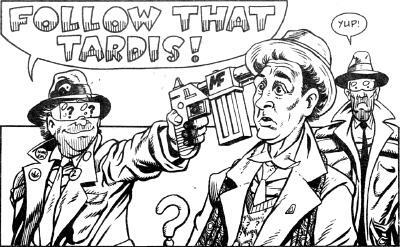 another of the Doctor's occasional crossovers with other comic book characters. This time he meets the Sleeze Brothers (basically a sci-fi version of the Blues Brothers). The Sleeze Brothers were about to debut in their own comic book so this was an attempt to attract some new readers. 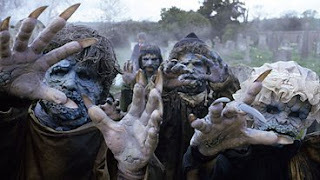 The story sees the Brothers and the Doctor chasing the Meddling Monk through time and space, travelling to various different periods in Earth's history and causing havoc along the way. This strip was pure comedy and, according to some, is more like a spoof of Doctor Who than anything else. The next story was a little more serious. 'Invaders from Gantac' saw the Doctor travel to Earth in the year 1992 to find that it has been invaded by aliens from the planet Gantac. 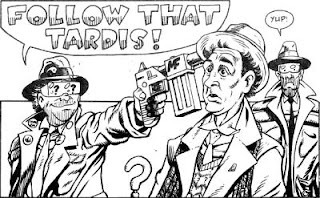 The Doctor teams up with a homeless man called Leapy and it's Leapy's fleas that save the day and defeat the invaders. Well I did say it was only a little more serious. 'Invaders from Gantac' concluded in issue 150 of DWM. The following issue saw the comic strip replaced with a text story titled 'The Infinity Season'. This was the first of only a handful of times where the comic strip did not appear at all in the magazine. 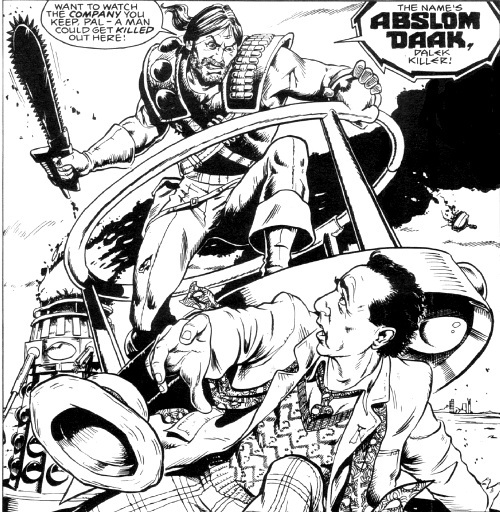 The next comic strip story saw the long awaited meeting of the Doctor and a popular character from the early days of the magazine - Abslom Daak: Dalek Killer. Although he had appeared in the back up strip of the magazine back in the early 80s, Daak had never met the Doctor until now. Here the two of them team up to take on the Daleks who are building a Death Star type battle station called the Death Wheel. Sadly their partnership proves to be short lived as Daak sacrifices himself to destroy the Wheel. The final story of the year was a one-part tale titled 'Stairway to Heaven' that was co-written by Paul Cornell who was destined to write some of the most original and popular Doctor Who fiction in the years to come. Finally I have to mention 'The Incredible Hulk Presents' which was a short-lived children's comic that ran for 12 weeks at the end of 1989. The comic included several comic strips such as The Incredible Hulk, Indiana Jones and of course Doctor Who. Because 'The Incredible Hulk Presents' was aimed at a younger age group than the Doctor Who Magazine, the Doctor Who strips were simpler and shorter than those in the Magazine. That being said, one of the stories - a 2-parter called 'Hunger from the Ends of Time' - was reprinted in the Doctor Who Magazine in 1990. One other story, 'Doctor Conkerer' was intended for issue 13 of 'The Incredible Hulk Presents' but when the comic was cancelled with issue 12, the strip instead made its debut in the Magazine.